Tenplay Video Downloader - How to download videos from Network Ten on Mac or Windows? Guide on how to download videos from Tenplay, YouTube, Vimeo, Facebook, VEVO, METV, etc. Have you tried to rip shows from the Network 10 Australia catch-up TV site Tenplay? Is there an easy way to download videos from the channel ten website? Are you looking for a Tenplay Video Downloader? How to download Tenplay videos or save them to local disk on Windows or Mac, or just make them playable on iPad, iPhone or android tablets? The ideal Tenplay Downloader - Bigasoft Video Downloader Pro could be a perfect solution for you. Bigasoft Video Downloader Pro is capable of getting the videos off your browser and it supports Tenplay, YouTube, Facebook, Vimeo, VEVO, MTV, Dailymotion and more video/music sharing websites. With this powerful Video Downloader Pro, it will be easy to download and convert online videos to your local disk, portable media players for avoiding the ads and playback offline. How to download/capture video from Tenplay? Firstly, simply download and install the Tenplay downloader - Bigasoft Video Downloader Pro. It is totally clean and safe. What's more, both Windows and Mac are fully compatible with the latest OS. Batch download videos from Tenplay, YouTube, Facebook, Vimeo, Dailymotion, Metacafe and more than 100 video sharing websites. Fast download and convert online videos to MP4, MKV, AVI, WMV, WTV, VOB, FLV, WebM, etc. Rip and extract audio from online videos to MP3, M4A, WMA, WAV, OGG, 3GA, etc. Save online videos to compatible format for editing with iMovie, Final Cut Pro, Sony Vegas, iDVD, Windows Movie Maker or other video editor apps. Go to tenplay.com.au and copy the URL of the video which you want to download, and then paste it to the URL box on the Download panel. As soon as you have copied the URL of the Tenplay video and mouse over the Past URL box, the URL of Tenplay video will be pasted automatically. One-click to download Tenplay videos. From Activity panel, you can check the downloading process. After a few minutes, the Tenplay video will be downloaded and converted to destination path. For live events, please capture them with the build-in video recorder. Open this guide to find "How to record streaming videos". 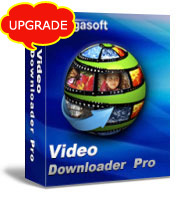 Want to try other helpful features of Bigasoft Video Downloader Pro. Just download and have a try!